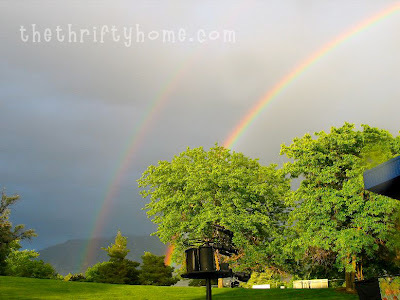 All month long it has been unusually rainy and my kids have been home from school for Summer vacation. Because they couldn't play outside, they were starting to veg out on the computer and wii. I decided to take them over to Joann's and use my 50% off coupon I always get in my e-mail every week. If you are not on their e-mail list you can sign up here. 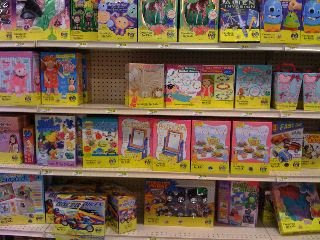 They have a whole wall of kids crafts. We bought a lip balm kit with the 50% off coupon making it $9. Their tie-dye kits were on sale so I picked one up. We started the tradition of doing tie-dye every summer 2 years ago and they were quick to remind me to get a kit for this year. 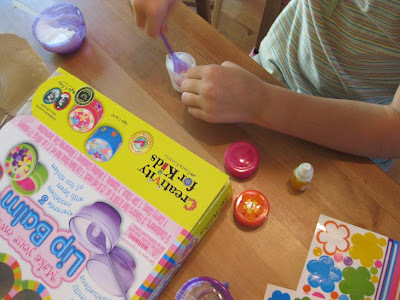 I have made lip balm before out of shortening, kool-aid and film canisters, but the kids really had fun with this kit (I also don't have any film canisters these days with digital cameras). They mixed their flavors and decorated their lip balm canisters with stickers. What a fun afternoon and so worth the $9 to have them doing something that didn't require electricity. Today I did the tie-dye with my kids and their friends and am washing the shirts as I post this. I will show pictures of the tie-dye for my next post. 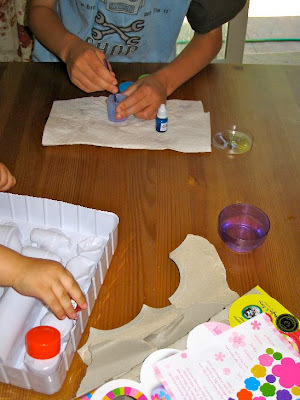 This week I was HOOKED ON rainy day crafts. To see what other people are HOOKED ON, visit the Hooked on Houses Link Party. I love the decals that Julia posted; if you leave her a comment you might win one! 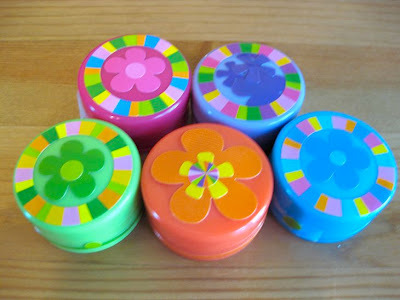 Those canisters of lip balm are so cute and colorful. It's great that your kids like to do things like that! Oooohhh arent these GReAT ideas!! Very nice! We just got back from our "vacation" visiting friends and family so this rainy day tip will soon come in handy for me. Thanks! Great post. Looks like a fun activity.